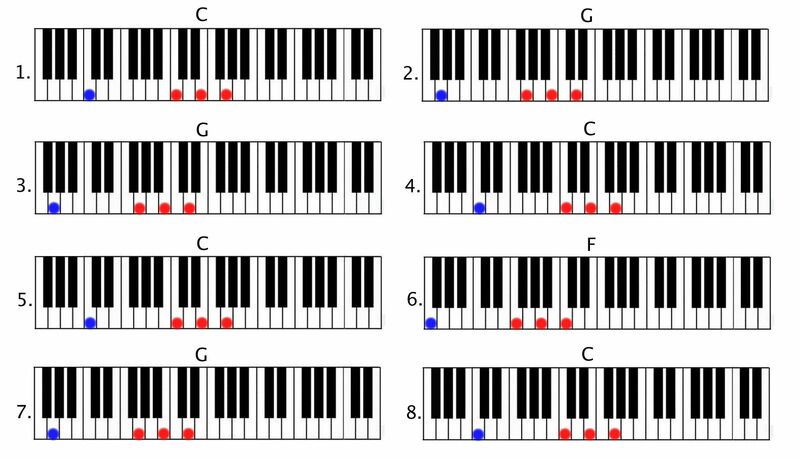 Welcome to lesson three of the Hack the Piano Launchpad, the intro course to playing piano by ear. The layout of the Keyboard and how to quickly find and remember any white key. How to use them to play the majority of happy birthday. Play an entirely new song using these exact same chords. -> chords are like words, re-usable in many different sentences and conversations. Here’s the names of the white keys. Remember that it’s only this chunk of the board that makes up the actual layout. After remembering that, it’s just a matter of copy-pasting it all over the board. 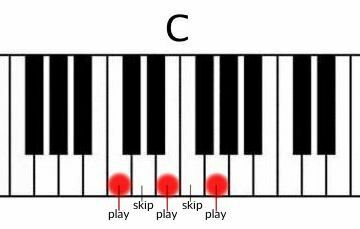 When we want to play a C chord, we look for the note “c,” and start building the chord by playing that note (the “c”) then skipping a note (not playing the “d”), playing the next (the “e”) skipping one more note (omitting the “f”) and then playing the next again (the “g”). If you look at the form of the G chord that we played after that, you might notice that it’s form resembles the form of this C chord quite a lot, don’t you think? That last chord is called the F chord, and as you might have noticed is built the exact same way again, now starting on “f” – obviously. C -> start on “c” & play, skip, play (“e”), skip, play (“g”). G -> start on “g” & play, skip, play, skip, play. F -> start on “f” and do the same. All three of these chords can be explained as built by: playing a note, skipping a note, playing a note, skipping a note, playing a note – remember this to be able to re-construct yourself. The easiest explanation – which for this moment perfectly suffices – of “Bass” in music is the lowest note that is played. It’s the “founding” note(s) of music. Bass is often played with a bass guitar or a synthesizer, but on the piano we have the great fortune of being able to play those low notes as well, with our -up until this point- lazy left hand. 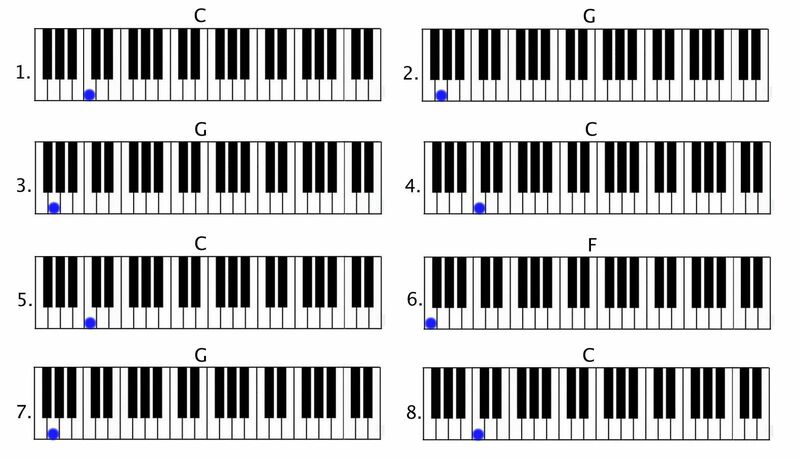 Since the left hand plays even lower than the bottom note of our right, this is the actual “start” of the chord and adding the appropriate bass note is therefore as easy as playing the root of the chord – the note that the chord is named after – low on the keyboard. How low, you ask? Well, let’s try one “chunk” – called an “octave” – lower. Let’s try and play the whole Happy Birthday round with the left hand playing the roots of all three chords. Sing along while you’re playing this! Tip: if this is difficult for you (and by “difficult” I mean – impossible; we’re learning something here so it’s fine if you’re struggling – pushing your limits. That means you’re growing), try to first play the right hand chords separately (no left hand bass notes) a few times. and after you’ve done that a few times, add the right hand chords – playing both hands simultaneously. Do you hear how much depth that bass adds to the sound? How full it now sounds? Bass is as easy as playing the note that the chord is named after – the root of the chord – one octave below the lowest note of the right hand. But doesn’t it ever play more difficult things? Of course it does, but we’re starting at the basis -which already sounds pretty awesome- which is in fact the actual basis of the bass – the starting point from which the bass “thinks” and bass lines emerge – It is in fact the basis of music in its whole. Huh? Weren’t C G and F the chords of Happy Birthday? Well yes definitely. 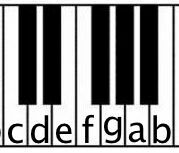 However, just like words, chords can be used in many different sentences and conversations. As a final challenge, before I leave you to mess around with the stuff learnt above: to develop creativity and a good feel for music, try to play the chords you now know, in a few different orders and see what you think sounds good. Don’t be afraid, just bash away! (for example: F F G C – G C G C F – C F C F G C – whatever! Experiment. Get creative. Maybe even try adding a bit of rhythm?). Have fun and see ya next one!